Newport Beach Community Emergency Response Team volunteer Richard Eimers talks with guests after his March 4 presentation about his experience helping out after the Camp Fire in Butte County. At a community presentation earlier this month, a longtime local resident recapped his recent experience volunteering to help following what many consider the most devastating wildfire in California’s history. 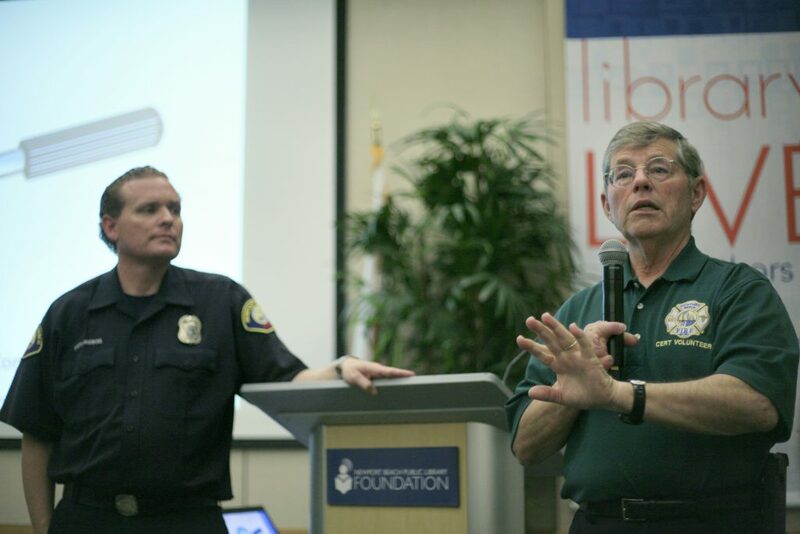 It was a pretty incredible experience, Newport Beach Community Emergency Response Team volunteer Richard Eimers said during his talk on March 4 in the friends room at the Newport Beach Public Library. It was emotional and he was moved to tears several times, he added. Late last year, the state sent out an alert asking all 480 CERT programs in California for volunteers for a week-long assignment assisting in the cleanup of the catastrophic Camp Fire in Paradise. It was a very unique call and indicates the importance of CERT volunteers, explained Newport Beach CERT program leader Matt Brisbois. 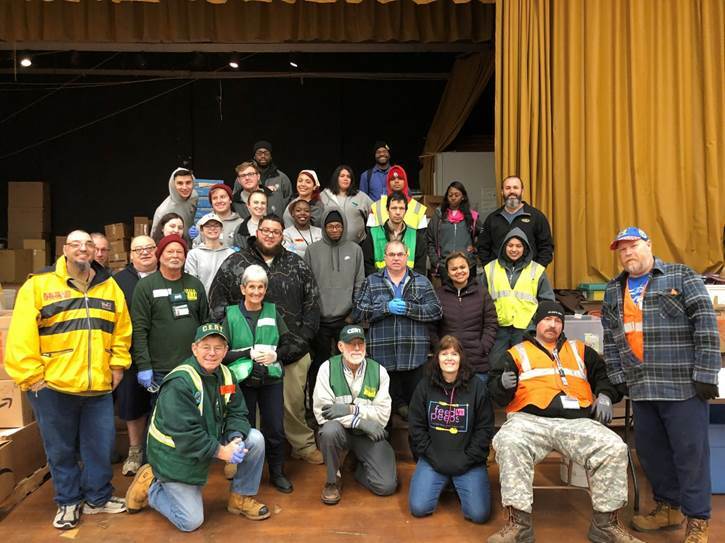 He sent out the request to local CERT volunteers and received a handful of interested replies, but most didn’t meet the requirements outlined by the state. There was one volunteer, Eimers, who checked all the boxes and was willing to head up to Butte County and take on the task. It was a very proud moment for the NB program, Brisbois said. About 70 volunteers across the state responded, Brisbois said. 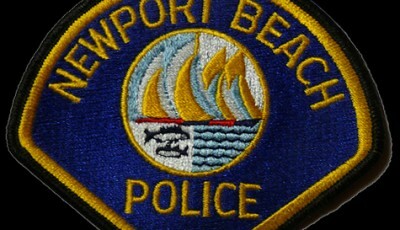 Out of the 34 active CERT programs in Orange County, only two activated, Newport Beach and Anaheim he added. “For most programs, the liability of sending someone up to Butte County is simply way too great,” Brisbois said. He had no control over what type of work the NB CERT volunteer would be doing, Brisbois noted. The state request indicated they needed the most help shoveling and cleaning up after large livestock animals, he added, and they thought Eimers would be ding that every day during his time up north. Eimers ended up working at three locations: A supply distribution center, a behavioral health desk, and the animal shelter. He left around 4 a.m. on Jan. 8 and after nearly 500 miles he arrived in Butte County. After checking in, he was immediately sent over to help with support at the Hope Center distribution center. By the time he finished and actually got to the base camp it was dark (and muddy) and late. “The stories that some of the people had, those are heartbreaking,” Eimers said. Eimers also volunteered to help out at the behavioral health booth at the Disaster Recovery Center, the headquarters for numerous agencies hosted out of an old Sears retail building. He provided crisis counseling and referrals for survivors. 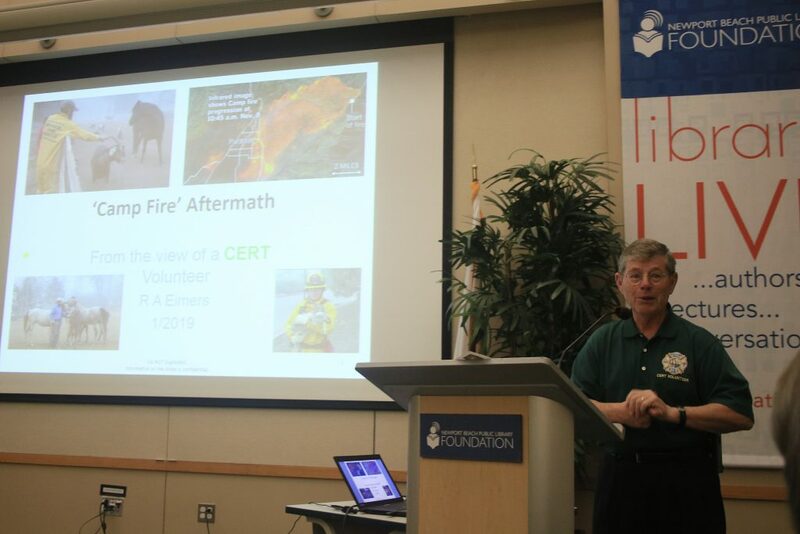 Newport Beach Community Emergency Response Team volunteer Richard Eimers talks about his experience helping out after the Camp Fire in Butte County during his presentation in the friends room at the library on March 4. For this specific assignment, the CERT training he utilized was preparedness and psychology, everything else, like fire suppression or search and rescue, “Throw it out the window,” he joked. For this particular assignment, he didn’t need anything else. Skills like patience, listening, offering moral support, and performing remedial tasks (sweeping, cleaning, stocking, paperwork, etc.) were the most important, Eimers said. Eimers also spent a few days working at the animal shelter, located on the Chico fairgrounds. There he cleaned up after animals, cleaned kennels, walked dogs, and more. It was constant work and the days were long, he added, but he would do it again. During his presentation, Eimers also explained how the fire started, moved, and grew. It was so fast, the fire sometimes moved on before burning an entire bush, Eimers said, as he showed a photo of a half-burned shrub. The wind pushed the fire along and simultaneously extinguished the blaze that was engulfing half of the bush, he explained. “That’s how fast that fire was moving,” he said. He talked about the terrain in the area and the evacuation path. The main route was so clogged with traffic that some residents went up into the mountains and back down the other side to get away. He also showed the before and after photos of his friend’s home, which was destroyed in the fire. Everything but the chimney and mailbox burned down, he noted. “Be aware, this is a message that we all need to think about,” Eimers said, noting that senior citizens were particularly vulnerable. 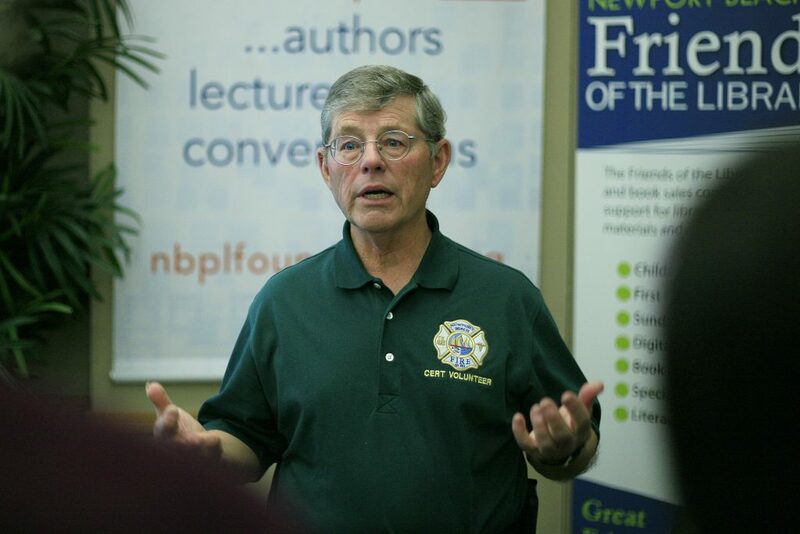 Newport Beach CERT leader Matt Brisbois listens as volunteer Richard Eimers answers questions about his experience helping out after the Camp Fire in Butte County during his presentation in the friends room at the library on March 4.